The success of the Balanced Scorecard implementation depends a lot on the fact that the alignment was achieved or not. We are talking about the alignment between business goals, actions, indicators, or simply about the understanding of the strategy on different levels. From the case studies below you will learn how to deploy your Balanced Scorecard, and choose appropriate business goals and KPIs. We are using BSC Designer for making an alignment between the objectives and the goals. It is used to the present strategy of my company. The product seems to be fine for working with the development of the strategic concepts. It can also be used successfully to add initiatives to the indicators. This type of alignment needs to be done in order to ensure that company achieves expected results. The strategic map has to be easy to read so one can detect very accurately the main processes and financial goals that company needs to develop to achieve increase of profits. Thank you for your feedback. I think that your approach to strategic planning is correct and will finally drive a company to its desired financial outcomes. 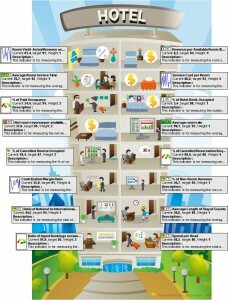 The mentioned approach (from objectives to KPIs) works perfectly in large corporations as well as in small businesses. An opposite approach when people tend to start with KPIs and then are trying to find a business objectives that are relevant doesn’t really make any sense. That’s the strategic process that any company should employ to formulate strategic objectives and then support them with KPIs and specific strategies. Defining a mission (the purpose of the company). Defining a vision, which is a top-level goal. Defining more specific business goals. Adding measurable and tangible objectives. Placing objectives and goals on a strategic map. Finding lagging and leading KPIs. 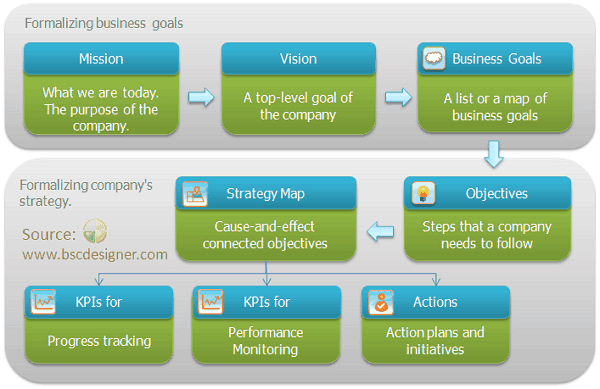 As you mentioned, in BSC Designer it is possible to align an action plan with KPIs and business objectives. The whole picture gives us a strategy, which explains not only a “How?” question, but a “Why?” question too. For example any action plan or initiative can be called a guiding policy. It explains how exactly we are supposed to achieve a tangible and measurable objective that we have. On the other hand, on a strategy map we see why we need to achieve this objective, how it is connected to other objectives (to benefit from this type of strategy map one should first build it according to company’s goals and objectives). In this way, an alignment provides a company not only with a detailed guiding policy, but with an actionable strategy. With this product we are looking for a way to align and control strategic objectives and projects in the tourist sector with suggested actions. The product is well designed, it is user-friendly, and it has a nice graphical interface. It gave us numerous options to control our strategies. It supported us from the first steps in our mission and vision development to the total control of strategy using indicators. Another benefit that we saw from the very first presentation of the product is that BSC Designer team is always ready to help. They explained the functionality of the product on the website, as well as via email lessons. It is also very versatile in the sense of using is from various platforms such as PC, tablet. The web edition is spectacular. Henry, thank you for sharing your opinion. We are glad that BSC Designed helped you with aligning strategic objectives and actions. We believe that in this way you will be able to control better the performance of your company, and what is more important to come up with a better strategies. I believe these are two crucial tasks in the fast changing tourist business. I’m sure that you already seen this article, but I’d like to mention it for other visitors of our website. We were speaking about various ways to come up and improve a business strategy. The mentioned approach explain how to start with a business problem or limitation and then convert it into a strategy controlled by key performance indicators. Keep reading our lessons and you will find even more information about KPIs, and business performance management. If you are interested in specific cases and applications of the product in touristic sector, don’t hesitate to let us know. In Wbric-Rpérez, C.A. we are always in the search of the most efficient technology to offer our clients the maximum quality for their projects. After evaluating BSC Designer, we believe that it complies with the requisites that make it a marvelous tool for deployment and strategic control. The tool’s principal attributes are its easy handling and adaptability to any type of business. We use it in business of food production, mass media and education. Translated by BSC Designer staff. Thank you a lot for trying BSC Designer. The product can be easily adapted to most business models and business tools. We know that some of our clients use KPIs only and other focus their attention on strategy maps. Talking about business frameworks, BSC Designer with its features can support the most popular ones. By design it was prepared for the Balanced Scorecard, but it can easily provide executives with help to analyze a company using 360 degree analysis or 7-S framework. The key is about a combination of BSC Designer’s business components. Everybody likes KPIs, and the usage of KPIs is mastered in BSC Designer. One can create new KPIs manually or export them from Excel. The next are for sure strategy maps and business goals. In BSC Designer it is possible to formalize business goals and objectives and then the software will help building a strategic map. The classical toolkit of a business executive includes a dashboard. In BSC Designer a dashboard can be linked to KPIs and strategy map. Finally, a wide range of reports allow to use BSC Designer to share strategic and operational ideas effectively. I hope you and your clients will benefit from our software a lot! BSC Designer will allow us to deploy our Balanced Scorecard in less time and with an added value. I’m very happy to discover BSC Designer Light. Actually it is a very good product. It has usability features that motivate us to work with it. Personally, I need more training and practice with BSC Designer Light in order to be able to use it effectively, and in a more time efficient way. It was a very good idea to share a free version with users. Thanks to it I had a better idea about Balanced Scorecard and BSC Designer software and it motivates me to ask for the full version of BSC Designer in order to benefit from its additional options. That’s exactly how we see the role of the freeware Balanced Scorecard software. It helps users that just start with a Balanced Scorecard to catch the spirit of the Balanced Scorecard automation. 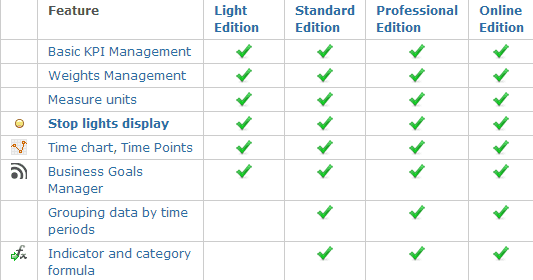 For sure it has only basic features compared to standard and pro editions, but still people use it to get familiarized with a BSC concept. I had reports from professions who used BSC Designer Light as a software tool to teach business classes. As for training, we have video manuals available for free on our website. They explain in detail how to do what you need with BSC Designer. Hope to see you among users of BSC Designer PRO soon. We are using the BSC Designer tool to create and manage a balanced scorecard for our department and for linking the goals to the company strategy. BSC Designer is an easy to use tool that makes creating and managing KPIs and strategy maps simple and quick. Having used the PRO version during trial period and the free version I am confident in recommending your product to any company that uses or wants to use a balanced scorecard approach. It is a most useful product! It is great to see another customer of BSC Designer from South Africa (you might be interested in reading a story by strategy consultant Qbit, South Africa about implementing a strategy)! Your approach to the Balanced Scorecard is very logical. KPIs cannot really exists with a strategy map, that’s why it is critical to have KPIs on scorecard that are aligned with a business context. We wrote about this in “Why most KPIs don’t work and what to do about this.” Unfortunately, according to a recent survey many companies forget about this and focus on KPIs only. The result is that they are not really satisfied with their scorecards. 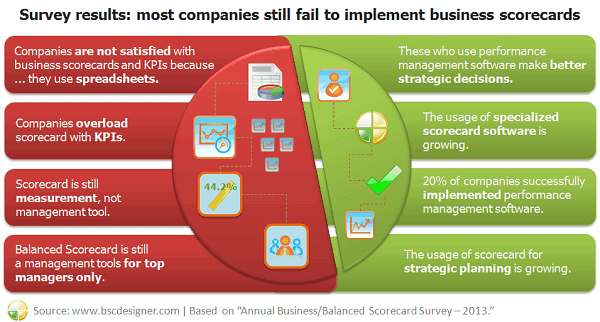 Scorecards without a proper business context are doomed to fail as a measurement or management system. 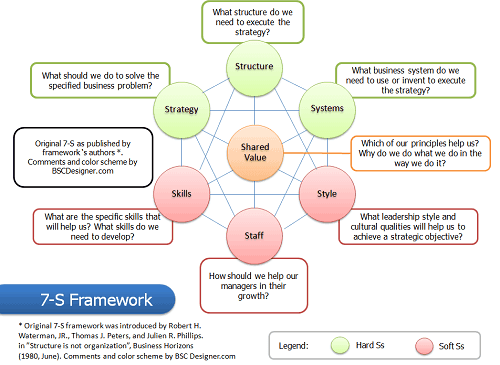 As you noticed, in BSC Designer we help to focus on both – a strategy map and KPIs. In BSC Designer one can map important business objectives, link them together in a map and align KPIs as a measurement tool. This how-to article explains the process in detail. Finally, in BSC Designer one can manage not only goals, but objectives (check out the difference). The software doesn’t require users to enter specific details, so when a company doesn’t have a fixed strategy initiatives in a form of business objectives yet, it can map its goals.